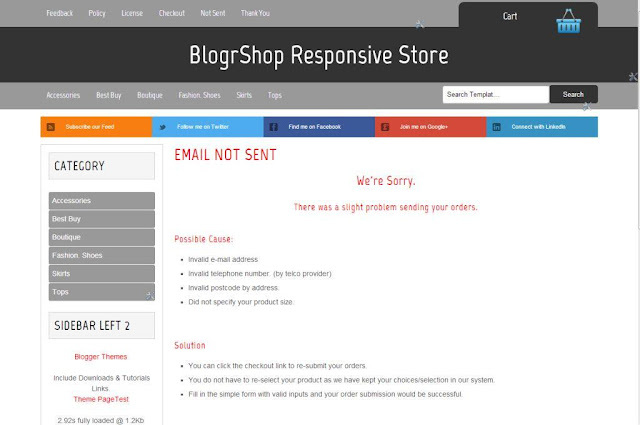 In addition with the BlogrShop installation, the responsive Blogger store template is already equipped with social bookmarks. For example, you can easily link to your Google+, Facebook, Twitter, LinkedIn and even your blog store RSS feeds. We also have upgraded the social bookmarks stylings to work on any screen sizes too. Yes responsive and works well from iPad screen to small mobile devices. The social bookmarks is placed very dominant in the top pages to let your users/customers/visitors share your products via social networks streaming, and lets you, as blogshop owner, get in touch with your loyal visitors. The dominant social bookmark, helps you to connect to your profile. Go to Template (back up template if nescessary) > Edit Template. FYI, we also update our Blogger templates from time to time, in making sure each and every 3rd party libraries is working as it should. Why? It's because these Blogger store templates is actually live and being used by our friends and clients blogshops. So, we're providing support, the best we can for Blogger template customization, template sponsorship and anything Blogger related activities. Well some people say it's hard to find good help today. Since our inception and active support with concrete5, the awesome content management system (CMS), via forums and concrete5 based responsive website template contribution, we've been supporting the on-line community ever since. Hopefully we would provide the same support to Bloggers too. Cheers.